Flying Iberia: Barcelona-Madrid-Lisbon Trip Report | Vishal Mehra and Co. This is the second part of the ongoing piece about Flying Iberia & experiencing it’s lounges in Barcelona and Madrid. The first part detailed my experience at Iberia’s Domestic Business Lounge in Barcelona. 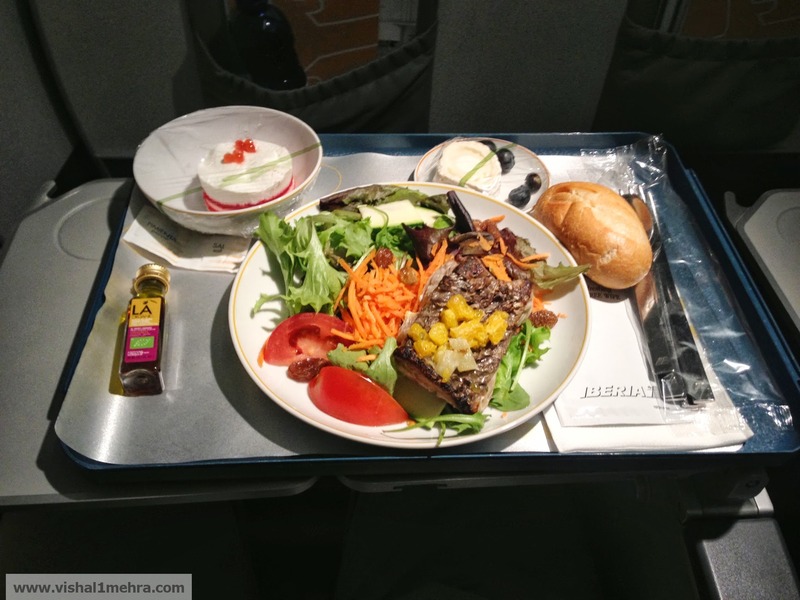 In this piece I finally get some flying and report my experience of flying in Business class (my first time ever) with Iberia on two legs, Barcelona – Madrid and then after a layover of almost three hours, Madrid – Lisbon. All Iberia domestic flights, flights to Europe, North Africa operate with the same configuration. 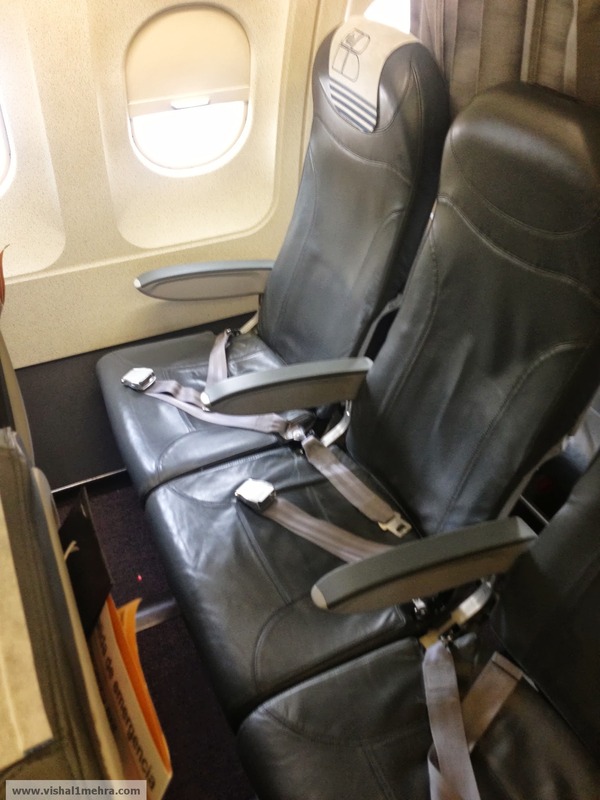 In Europe, most airlines don’t have a separate cabin for business class passengers. Instead, they use a mobile curtain that is moved after each flight in order to separate both according to the number of passengers flying business class in each flight. This allows airlines to be more flexible, since an Economy class seat can be converted into a business class seat just by moving the curtain. My business class seat was an upgraded economy seat with increased seat pitch (34 inches, instead of 31 in economy) and an empty middle seat for increased comfort. 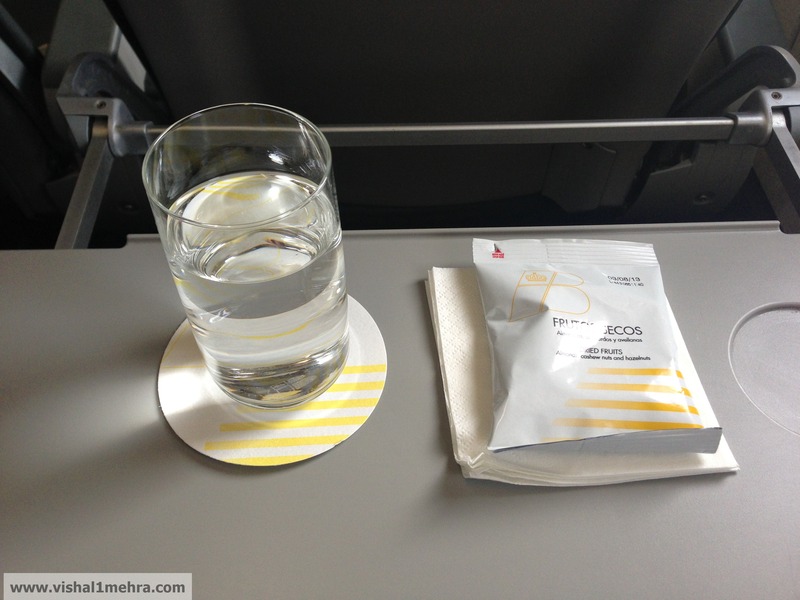 As I settled into my seat I was offered water and something to munch on, while the cabin was getting ready for our on-time departure to Madrid. Our departure was smooth, and looking down at Barcelona I saw the beauty of the city once more albeit with an aerial view, bathed in sunshine. Soon after reaching cruising height, a purser came over and asked for my choice of drink. As this was a short 1-hour flight, and it was early evening, there was no specific meal service. 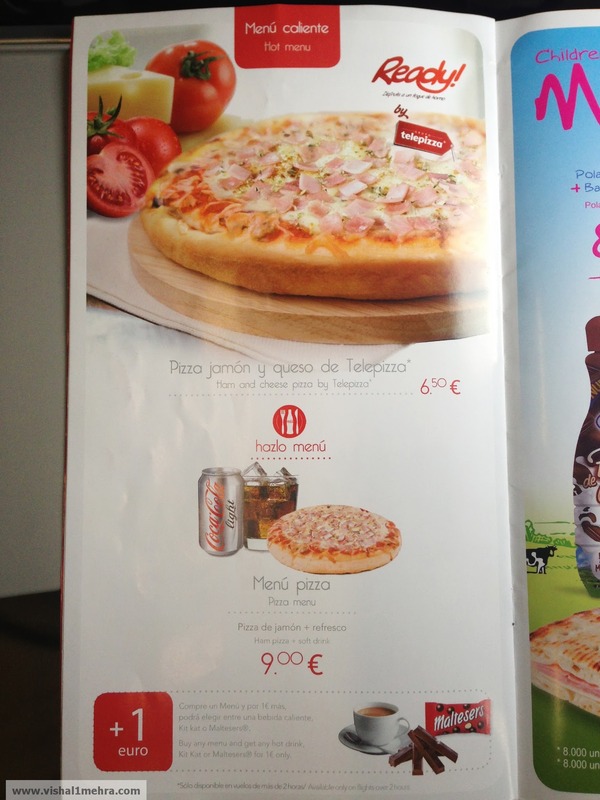 Looking through the magazine I chanced upon Iberia giving out Pizza at 36000 feet to its passengers, which I thought was pretty unique. I woke up while we were on our landing approach to Madrid Barajas and I never got my drink, and considering we were on approach, I did not bother reminding the crew of their slip-up. Humans tend to forget things and considering it was my first ever outing in semi business class, I was in good enough humour to forgive as well, but Iberia should take note of such slip-ups, which while minor, have large impact on passenger impression when they occur in the premium cabin. Soon enough the landing gear was down and we landed in Madrid on time. Disembarkation was quick and I was off to explore Madrid’s famous wavy terminal and the flagship Iberia lounge. After spending considerable time at Madrid’s Terminal 4 & the Iberia Dali Lounge (Schengen area) I proceeded to the gate for the second part of my journey. This was going to be my first ever time sitting in 1A, that magical number in airline seating wanted by enthusiasts, which was automatically allotted to me by Iberia. I boarded the aircraft to similar seating arrangement, but this time the curtains were drawn further from the second row itself, so there was just two rows of business class seats on this flight, and two out of the eight available seats remained unoccupied. Including the aisle seat in my row. 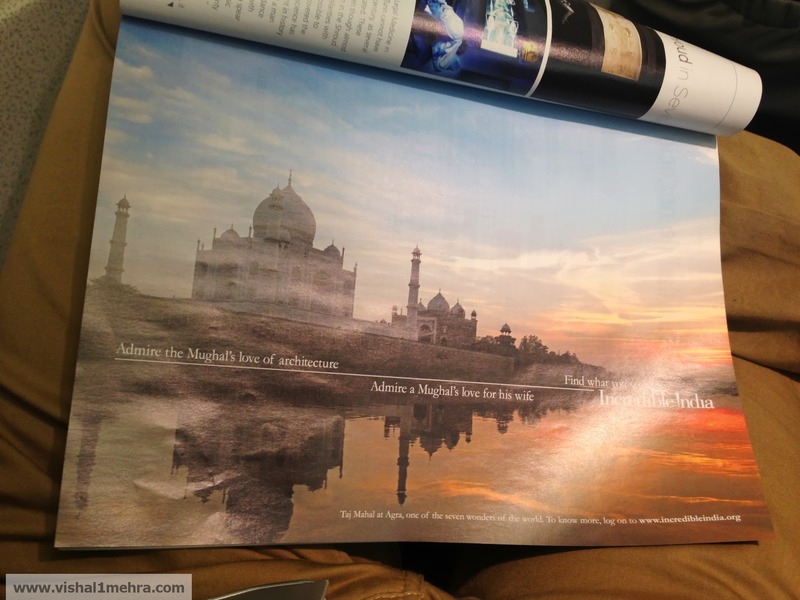 Flipping through Iberia’s magazine, I came across this print ad featuring the Taj Mahal and promoting Incredible India. Bought a big smile to my face. At least MoT babus are working somewhere. The pre-departure service consisted of a drink and nuts. I chose to go for a tried and tested beer. I was also relieved to see that the cabin crew were well versed in English, just like the last flight. Service on this flight was better, may be because it was a Schengen flight and I was surprised to find a full-blown dinner served during this short 1-hour hop to Lisbon. Service in Business class was taken care by the chief purser on both the flights. I finished my dessert but the fish & salad did not appeal to my taste buds. As soon as I finished dinner we were descending to Lisbon & the beautiful city came in the view with bright lights & hills around it. The landing again was a smooth affair and within five minutes we were at the disembarkation point. The only negative aspect of this flight was the exit through stairs and buses ferrying passengers to the main terminal. For a full service airline like Iberia, these are inexcusable points, which need to be taken care of in this day and age. Aerobridges are basic hygiene of air travel especially when you’re not traveling in a budget airline. I do remember seeing some empty aerobridge gates on our left before we parked at a remote bay. The level of service on both flights was professional, yet missing that touch of warmth, which as Indians we expect and something which most of the Asian carriers do very well. Will I fly Iberia again, may be in economy? Yes, if the price is cheaper or at-par with low cost carriers. The third and the final part of this piece will highlight my report of Iberia’s flagship business class lounge at Madrid Airport (for Schengen passengers). A slightly modified version of this piece is featured on Bangalore Aviation, a leading International website on Aviation. 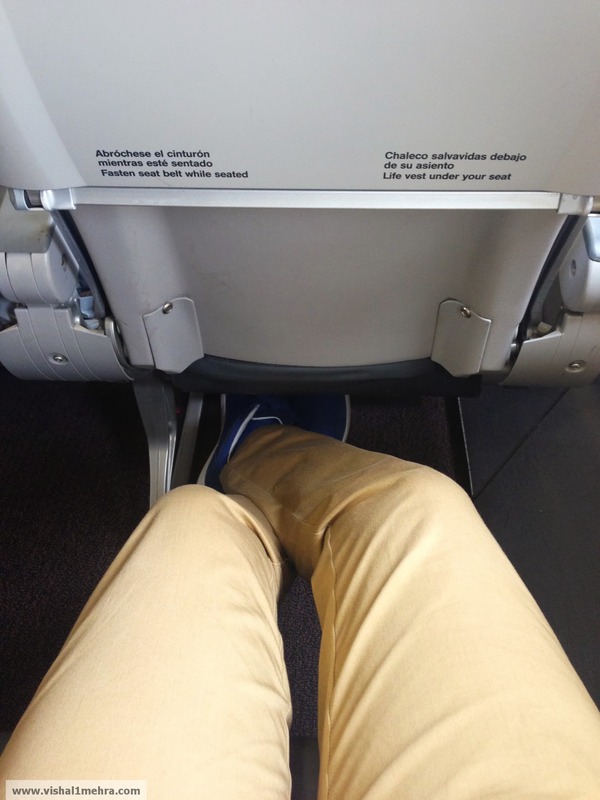 July 3, 2013 - 01:01 Pingback: Flying Iberia: Madrid Barajas Schengen Lounge Report | Vishal Mehra and Co.
January 14, 2015 - 04:46 Pingback: Review: Is Vistara’s Premium Economy worth it? | Vishal Mehra and Co.